In a world of drones, robots, citizen science, deep learning, machine learning and artificial intelligence, it is becoming more and more important that citizens know the basics as well as the ethics of digital technology. Starting today we can lay the groundwork for the fair treatment of workers in a digital economy that promises to unlock huge productivity and quality of life improvements. Our challenge is to ensure those gains are distributed equitably throughout society and not the spoils of a winner-take-all economy. The basics include ethical use of information (also about people) and how to find quality information (especially given the lack of access to libraries in some communities, and because of fake news crossing our paths every day), critically evaluate information, and effectively communicate information. Together with compositional literacy skills (reading and writing), computer literacy is more and more considered as an equally important skill to possess in developed countries. And like compositional literacy, media (incl. information and computer) literacy can be taught and learned. The In the Cloud approach assists all citizens to become responsible users of digital tools and the Internet – both as downloaders and uploaders. 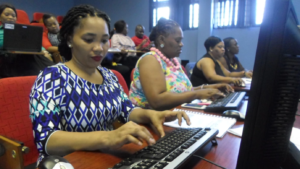 Training sessions and training manuals are aimed at addressing specific needs experienced, and contextualised accordingly – whether for school learners, students, teachers, librarians, business people, entrepreneurs, health workers, or more. Each training course offered is unique, and compiled according to the needs of a specific user group – whether it is health workers, personal assistants, researchers, librarians, teachers, or more. Theoretical principles are combined with digital tools to make the learning a valuable and lasting experience. A needs-based approach is followed, using content and tools to respond to the needs experienced by the workshop participants. The main training centre is in Pretoria, South Africa, but we aim to bring the training to you – no matter where you are. Please contact us should you be interested in training, and we can discuss an approach that will best address your needs. We are flexible in terms of the content, and also in terms of the duration/dates of delivery. A maximum of 20 participants per workshop are preferred, for all to benefit optimally from the training. At any given time, each workshop is presented by two facilitators – one to facilitate and the other to assist participants. A separate curriculum has been developed for each user group. For example: the curriculum for teachers therefore slightly differ from that of librarians, and others, following different services offered by different user groups. Both facilitators/authors/directors bring a wealth of knowledge and in total 38 years of experience in education, information, computer application and training to the table, and are passionate about this subject. Numerous workshops have been presented in piloting all, leading to the now formal curriculum as discussed on this web. Through this approach, incorporating media and information literacy together with computer literacy, each and every citizen will learn to play an active role in his/her community, and become lifelong active digital citizens.